It’s amazing that after so many years the original Star Trek series still holds so much appeal. But it does. Hopefully you’ve all been glued to the new, digitally remastered editions of Star Trek, running on the weekends in late night syndication. The show’s prints have been cleaned up and its effects redone, and classic Trek has never looked more beautiful. One of the people responsible for it is the great Michael Okuda, long time member of the Trek team and one of their most talented designers. I’ve been a fan of this guy’s work forever, and now every week I completely geek out whenever he sends me an email, as he almost always does, containing preview images of this week’s remastered episode. Tonight after playing professional for months I finally lost all control and had to send him back an email telling him what a fan of his work I am. 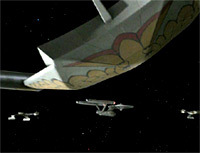 By tomorrow morning I may have a restraining order, but for now we have a sneak peek at what Micheal Okuda and the folks at Trek have in store for us in this weekend’s newest remastered TOS episode: The Enterprise Incident.